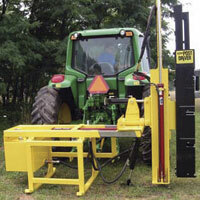 equipment capable of handling the most difficult jobs. Because there are 8 wires in a 4-strand barbwire fence (2ply) and we are relying on strength and tension rather than the spike of the barb. Barbwire breaks at 950 lbs. of pull (2 ply 12 1/2 gauge). Max-Ten 200 High Tensile Wire doesn’t break until 1540 lbs. (200,000 PSI 12 1/2 gauge).